OOTD: Soylent Green is People!! I am reading a particularly creepy - well all her books are creepy, but this one more so than others - Margaret Atwood book called "The Year of the Flood". As usual it is about a dystopian society before and after a great apocryphal catastrophe. Its horrific and funny, and focuses on people from a religious group called Gods Gardeners. Anyways, green has been on my brain. Ooh, book idea! I've already requested it from the library. 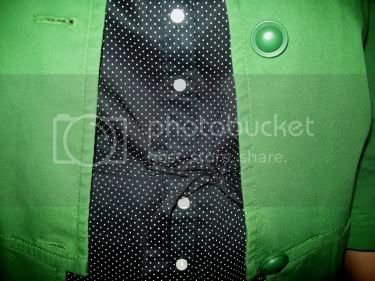 Love the green with the polka dot top. That top is really cute with the bow detail. I'm so bummed about the outlet sale at Talbots. They don't have the few items I've been coveting. At least the couple things I tried on in the store this weekend are on sale now as opposed to just a 25% promo. The deal is much better now. I like the pink tweed skirt paired with that black and white animal print cardi. Hi! I'm new to you blog, via Gigi's blog! Love your style. I'm short and curvy also! I read one Margaret Atwood book in college. It was an alright book, but my professor in that class made us look at EVERY SINGLE BOOK through a feminist lens so she kind of put me off it. (Obviously gender issues are a good way to analyze a book, but there ARE other ways! And it was just a general lit class, not a gender-specific one.) Maybe I should go back and read again now that I won't have that class ruining Atwood for me! Would you recommend the one you're reading? BTW your summary of the book above reminds me of a book called A Canticle for Leibowitz. I read it for a high school class. I remember that it was about the world after a big flood/fire and how religious groups were trying to rebuild. I don't remember much else about it other than I liked it, and it was really weird/creepy. Love this outfit! The green with the black and tan is a good look. I read Alias Grace a few months ago and found it interesting but a bit dry. I've been told I should have started with one of Atwood's more popular books. I'll give her another shot soon; I have The Blind Assassin on my bookshelf and I'll probably take it to the beach with me this summer. Nicole - You should grab Oryx and Crake while you are at it, they are 2 parts of the same story. Sales always work that way - its never what you need LOL. I really like the cut on the blazer! Unique. And the khaki balances out the bright on black and white really well. Never heard of Margaret Atwood but I may have to check her out. another reader by way of Gigi, also short & curvy. Love the look. Keep up the good work!